Gabrielle Turnquest passed Britain’s bar exam last week, making the 18-year-old the youngest person to do so in the 600-year history of the exam. “I just really like finishing things before other people do,” she says. “I don’t do well with breaks or vacations,” added the teen, who credits her mother for encouraging her to focus on school while she was growing up. While the average Briton passes the bar exam at age 27, Turnquest got a big head start by graduating from college — Liberty University in Lynchburg, Virginia — at age 16 with a degree in psychology (setting a record there, too). Since it only takes about a year to complete law school in the U.K., Turnquest was able to enroll at The University of Law in York at age 17 and take the test this year. Now that she has passed the exam in the U.K., she can also take it in the U.S. without having to spend three years in law school stateside. 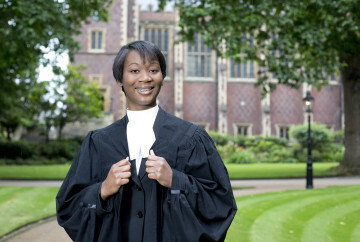 Britain dropped its requirement that prospective barristers be at least 21 years old before taking the exam in 2009. Despite the compressed timeframe for legal training in the U.K., pass rates for the bar exam are about the same there as in the U.S. However, British lawyers must also undergo a year of training or pupillage before they can practice law. Turnquest’s family is from the Bahamas, where she also has citizenship. Because Bahamian law is based on British law, she is qualified for admittance to the bar association there. But she says she plans to return to the U.S. and study for the American multi-state bar exam and enroll in the Fashion Institute of Design and Merchandising in California, where she will study to eventually become a fashion law specialist. Turnquest joins an exclusive club of young high-achievers. Thessalonika Azru-Embry is graduating this month from Chicago State University with a degree in psychology at 14 years old, and last year, Sho Yano became the youngest person at 21 to earn a medical degree from the University of Chicago. And Emmelyn Roettgerwas accepted as Mensa’s youngest member when she was just a month shy of 3 last year.